Shakshouka. I love saying that. Let’s say it again (go ahead, say it out loud). SHAKSHOUKA. It’s pretty big in food-blogging circles these days, but it’s long been a popular breakfast in the Middle East and Northern Africa. 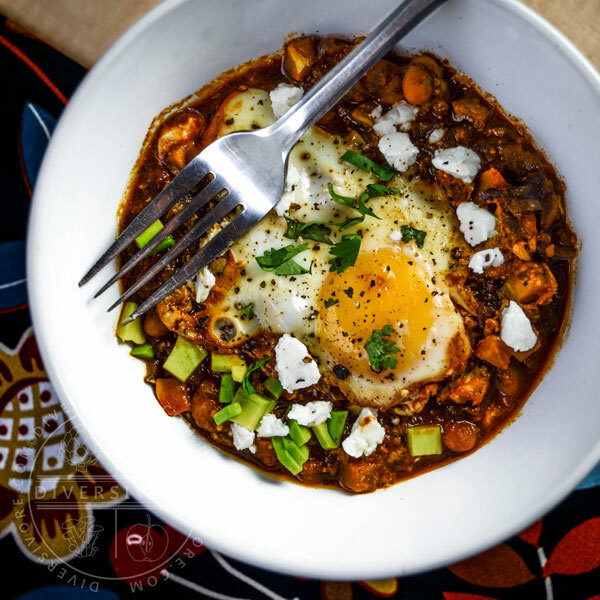 It’s not alone either – eggs poached in a flavourful, spiced tomato sauce is a recurring theme throughout the Mediterranean and Western Asia. Turkish menemen is quite similar, and Spanish pisto features a similar sauce, though the eggs are generally fried and served on top. But my personal favourite (by name, anyway – I’m a sucker for a dish with a cheeky name) has to be the Italian dish u’ovo al Purgatorio – eggs in Purgatory . Also sometimes referred to as eggs in Hell, the dish is sometimes confused or conflated with shakshouka itself. The similarity between these dishes got me thinking about departing from the standard recipe and taking the dish across the Atlantic. The ingredients are nearly universal, after all, and tomatoes themselves are actually native to the New World, so it seems fair to bring things full circle by reworking this into a Mexican recipe. This is hardly a new idea; Mexico has an extensive and diverse history of immigration, and this is reflected in the internationally influenced cuisine. To name one particularly prominent example, tacos al pastor evolved from shawarma recipes brought to Mexico by Lebanese immigrants. Mexico, of course, already has a wealth of egg and tomato recipes, most notably huevos rancheros (rancher’s eggs). That dish has more in common with Spanish pisto, and is nowadays usually served with tortillas. There’s also the tongue-in-cheek huevos divorciados (divorced eggs), in which fried eggs are served with carefully-separated green and red salsas. Like I said, I’m a sucker for a good name. I decided to forgo any reference recipes, and instead developed this recipe based solely around the technique behind shakshouka and the Mexican flavours I know and love. Starting with the simple idea – eggs poached in spiced tomato sauce with vegetables – I put together an ingredient list and started my little experiment. If you’ll allow me to toot my own horn here for a moment, it was a very succesful, VERY tasty experiment. Turns out that Mexican ingredients make for an absolutely incredible, if unconventional shakshouka. Tomatoes and tomatillos are boiled and then pureed with onion, forming the basis of a wonderfully flavourful sauce/salsa. But let’s not leave the other vegetables out of the spotlight either; summer squash (pattypan, in this case), squash blossoms, and pinto beans add delicious New World charm to the dish, and the avocado (another Mexican native) makes a perfect topper for the finished dish. Despite the fact that this is ostensibly an egg dish, it’s easily one of the most veggie-centric breakfasts I can think of. It’s also seriously healthy, delicious, and filling. And if it seems like too much food for you and yours, rest easy knowing that it somehow becomes even tastier the next day. After finishing the recipe and starting the writing, I ran across some similar Mexican-fusion egg dishes, but there seemed to be a preponderance of sausage, which to my mind takes the focus off of the eggs and veggies. What sets this recipe apart is the focus on very basic, very simple fresh ingredients. This doesn’t start with salsa, or tomato sauce, or even canned tomatoes. In fact, if you make your own beans (which obviously turns this from a quick breakfast to a more time-intensive brunch), then this is about as scratch-based as a meal can get (unless you fee like taking up cheese-making). Don’t be put off by the length of the ingredient list either – this is easy to make, and the different ingredients used here contribute incredible depth of flavour that you can’t get with an over-simplified tomato sauce. 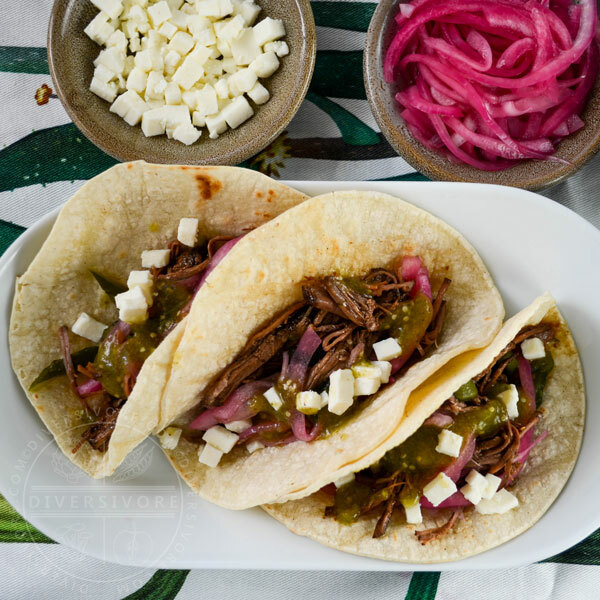 If you are unfamiliar with some of the ingredients, or you’re concerned about using up the excess once you do buy them, don’t be – once you start working with Mexican ingredients, you won’t ever look back. I’m going to do my best to be succinct here. At first glance, this might look like a difficult meal, but I promise you it isn’t. The ingredient list is a little long, and there are a few oddball ingredients in there, but I’ll break down how to use them, and how to work with alternatives. The core of this dish really centers around good veggies, good eggs, and a good spice blend – beyond that, you’ve got some wiggle room. Five minutes of reading through this section and you’ll see that this isn’t a toughy. I promise. Ancho chilies are easy to find at any Mexican or Central American grocery store and, depending on where you live, might even be found at your local grocery store. Don’t be intimidated either – the whole chili (minus stem and optionally seeds) is softened in very hot water, and the resulting pepper and soaking liquid go right into the blender along with the other ingredients. Whole dried Mexican chilies can seem a little intimidating to buy, but I promise you that you can find reasons to use them all over the place, and they store very well. Click here to read my guide to the common dried chilies, and check out this recipe, or this one for other examples of what you can do with anchos. If you can’t find whole anchos, there’s a decent chance you’ll be able to find ground ancho chili powder in the spice section of your grocery store. You can substitute approximately 1 tbsp of it in for the whole pepper used in this recipe if necessary, though you’ll lost a little bit of flavour without the soaking liquid. I will also note that ancho chili powder can be pricey stuff, so look for the whole chilies if you can find them. A lot of recipes like this begin with canned tomatoes, or even tomato sauce. If good tomatoes are out of season, then absolutely use some good canned plum tomatoes. Tomatillos are increasingly easy to find in grocery stores, and they contribute a lot to this meal (and to my Chicken Tinga, which is built around a similar tomato salsa). Those of you who have made an Italian tomato sauce before might be picturing a lot of time-consuming seeding and skinning, but the Mexican approach used here (which I learned from Pati Jinich) involves boiling the tomatoes and tomatillos whole, then pureeing them in a blender, skins, seeds, and all. You can even leave the the little ‘core’ section at the top intact – it won’t matter at all. Assuming you have a blender or food processor, it’s about as low-maintenance as you can get. If you’re making this in the late summer, look for little yellow or green pattypan squash and squash blossoms at a farmer’s market or well-stocked green grocer. Pattypans are ridiculously easy to use – just lop off the stem and dice the whole thing. They tend to have a very small seed of the dense ‘flesh’ than a zucchini. If you can’t find them, you can use zucchini or another summer squash, though I’d scrape out the central portion if it’s soft/seedy. Squash blossoms aren’t always easy to find, but they are easy to use. Wash them thoroughly but gently, and gently tear away the stem and the central portion of the flower. You should be left with a hollow tube that can be used as-is or cut into ribbons. If you can’t get squash blossoms, there’s an interesting, somewhat adventurous alternative. Day lily buds (i.e. the unopened flowers) actually make a tasty replacement for squash blossoms, and they’re an incredibly popular plant in gardens across the temperate world. If you grow your own, and you know they’re safe/clean (i.e. not doused in pesticides), give them a shot. For what it’s worth, nearly the entire plant is actually edible, including the tasty little potato-like tubers. For more information, check out this lovely article from Honest Food. If DIY lily buds are a little too wild for your tastes, take the recipe in a different direction and add use a little savoy cabbage, or even just a larger portion of summer squash. Alternately, you can reimagine the dish with other vegetables. Sweet peppers, eggplant, and even potato would all work very well. The spices in this dish play a very important role, so you want to afford them the attention they deserve. Sweet paprika should have a mildly sweet, earthy red-pepper flavour. Sadly, the tendency to use paprika primarily as a colouring agent in North American cooking means that a lot of the cheap paprika in stores has virtually no flavour. Toss that stuff and find a good paprika with a flavour you like. There are some great Hungarian and Austrian varieties, and Spanish paprika (aka pimentón) is also very good. Make sure that you use sweet paprika (or pimentón dulce), and not smoked or hot paprika. If you have a jar of paprika that’s been sitting in your cupboard for a year or more, toss it and buy some new stuff – old paprika (and old spices in general) tend to have only a fraction of the taste they possessed when fresh. You can buy ground chipotle powder at most grocery stores, but I recommend tracking down whole chipotle meco chilies. You can grind them one at a time in a spice grinder (or coffee grinder) and get an identical, fresher, and cheaper product. If you absolutely can’t find chipotles in any form, substitute an equal volume of smoked paprika. The taste is far from identical, but both spices contribute a wonderful smoky flavour that really comes through in the sauce. I like to use whole cumin seed, which I grind myself as needed, but pre-ground cumin is perfectly good here assuming it’s fresh. Once again, an old bottle of ground cumin isn’t going to compare to fresh stuff. If you do buy pre-ground cumin, get it from a good spice shop or a store with high turnover. You don’t want to pay good money for spices that have been sitting in a bin for 6 months. Ground annatto is the trickiest spice to find on this list. Fortunately, it can be left out without the dish losing a great deal. If you can find it, it adds a gorgeous orange-red colour and a subtle, earthy spiciness to the dish. Mexican grocery stores are your best bet for finding it, but do NOT confuse ground annatto with achiote paste. Achiote paste is a blend of annatto and other spices, including cumin. To add to the confusion, ground annatto is, achiote molido in Spanish, while achiote paste is called recado rojo. If you can find whole annatto seeds, feel free to grind your own, but do note that they are notoriously hard. If you do find annatto and you’re wondering what else to do with it, check out my Yucatecan fish tacos – they use annatto and ancho chilies. I went with avocado, cilantro, and goat cheese to finish this dish, but you can take it in a different direction if you like. Avocado is a must in my mind, but if you’re not a fan, then feel free to omit it. I feel the same way about cilantro, but if you’re among the unfortunate percentage of people who are genetically predisposed to loathe the leafy green, use flat-leaf parsley or even a few chives instead. I like goat cheese here because it’s relatively mild yet tangy, but any number of cheeses would work, including cheddar, Monterey jack, and cotija. You could also use Mexican crema, sour cream, or Greek yogurt. You can easily go dairy-free too by substituting a cashew-based vegan cheese and replacing the butter in the recipe with olive oil. Note that the nutritional information reflects a 1/6 portion (one egg, plus a healthy portion of sauce). Adjust accordingly for a larger serving, but it’s pretty darned healthy regardless. GOOD NEWS:Great news – this is a hearty, nutritionally dense, low-fat, low-calorie breakfast. Thanks to the eggs and beans, it’s also high in protein, yet completely vegetarian. BAD NEWS:A little high in cholesterol thanks to the eggs, but current science suggests that this shouldn’t be a concern for the vast majority of people. Bring a kettle of water to a boil. Remove the stem and (if you like) shake/scrape out the excess seeds from the ancho chili. Soak the stemmed/seeded pepper in 3/4 cup very hot water and set aside. Boil water, add tomatoes and tomatillos, cook for 8 minutes or until tomatillos are soft and olive green. Place the softened ancho chili and the soaking liquid in a blender or food processor along with the tomatoes, tomatillos, and onion. Puree the mixture thoroughly. Melt the butter in a large skillet (preferably cast iron) over medium-high heat. Add the squash and garlic and saute for 1 minute, then add squash blossoms and cook for an additional minute. Add the tomato sauce to the pan and stir in all of the spices. Bring the mixture to a simmer, stirring occasionally. Add the beans and simmer the mixture until the sauce is thickened and reduced; about 6-8 minutes. Use a spoon to create six 'pockets' in the sauce. Crack an egg into each pocket and poach the eggs in the sauce until done to your liking (I recommend a slightly runny medium-poach myself). Serve the eggs and the veggies/sauce in individual bowls and garnish with avocado, cilantro, and goat cheese. Alternately, you can garnish the entire pan and serve it in the center of the table, family-style. Squash blossoms are a lovely, textural, tasty element to add to a dish like this, but they can be tricky to find. If you don't have any, day lily buds actually make a tasty replacement as well, but unless you garden your own (and many people do - they're a wildly popular ornamental), they're not likely to be easy to find either. If you don't have either flower, take the recipe in a different direction and add use some savoy cabbage, or even just a larger portion of summer squash. Thanks Julia! Honestly I love tomatoes, but I don’t get excited when presented with a TON of tomato sauce. I need some substance in there, you know? So I get what you mean. But with the veggies and beans and the different flavour coming from the tomatillo… I was pretty pleased with this. I’m glad you enjoyed it too. Love shakshuka! And saying it too;) Also, are there variations on the spelling or have I also misspelled it? 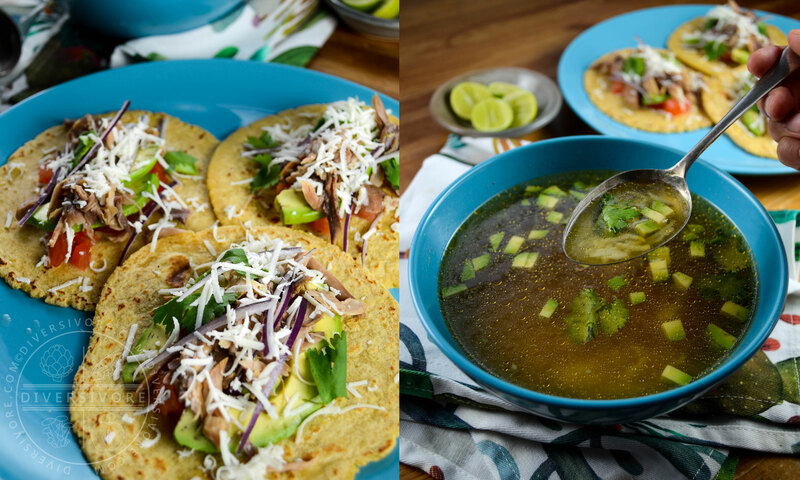 Your MEX inspired version looks absolutely mouthwatering! I love the breakdown of ingredients; extremely helpful. Yeah, there are definitely spelling variants out there. The word itself is Arabic, so you end up with a bunch of different spelling variations when it’s transliterated into the Roman alphabet. I’m glad you like my version, and I’m glad you appreciate the breakdown of ingredients. When I started out I spent a lot of time trying to figure out how to share my passion for oddball and uncommon ingredients without making my recipes unapproachable, and I decided (as I usually do!) that education was the key. I’m happy to do more work and share more info it if means people will try cooking these incredible foods! This looks like a wonderful combination of spices and great use of interesting ingredients! I didn’t realize that day lily buds were edible. I must try using some of my own. I’ll try to remember to catch some squash blossoms, too! Thank you Cathy! I’ve only had dried day lily bulbs (which are, believe it or not, a relatively common ingredient in Chinese soups), and they’re quite nice. I do want to try them fresh. And I definitely hope you can grab some squash blossoms when they come around! Oh Sean. Breakfast. Brunch. Lunch. Lupper. Supper. Late night snacks. WANT. This is the most beautiful eggy tomato dish I think I’ve ever seen – you make me this, yes? I’m totally pinning for the next time I find squash blossoms. I love EVERYTHING about this dish, dude. Seriously. You’ve outdone yourself. And the photos are GORGEOUS. It really does sort of transcend meals. I’d happily have it any time of the day. And for me, it’s the perfect brunch food… sort of breakfast-y, but hearty and savoury and really easy to love. So yeah, if you can drag yourself out to Richmond, I’ll have to whip up a seasonally-appropriate variation for ya. Get some coffee into ourselves, demolish a couple of bowls of this… good to go. Thank you so much, and thanks for the photo compliments. That means a lot coming from you and your GORGEOUS site. Cheers. Oh man, this sounds incredible! I’ve been craving more savoury breakfasts lately and am a huge fan of mexican inspired dishes — I’m putting this one on the list to try soon. Beautiful work, as always! Thanks Justine! While I love carb-based-breakfasts, I’ve never been much for the overly sweet ones (seriously, does powdered sugar need to be put on EVERYTHING?). I love a good savoury breakfast/brunch, and if it can transcend borders and work as a lunch or dinner, all the better. Let me know how it goes if you do take a stab at it! Cheers! Shakshouka is awesome! Need to try your version! Both me and my wife are fond of this!